Our organization relies heavily on donations. We do not receive regular funding from any organization and/or the municipal, provincial or federal government. We are a registered charity. CRA registration number 83024 4802 RR0001. As a volunteer-run organization, your donation goes directly toward our work on behalf of the animals. We do not have paid staff, a facility to pay for or high administrative costs. 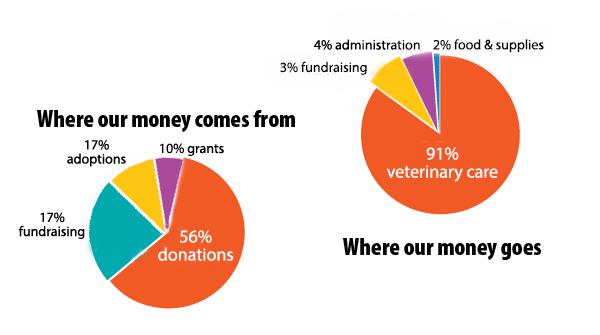 In 2017-18, 93% of our expenses were medical care, food, and housing for our animals. Tax receipts are issued for donations of $20 or more and are mailed or emailed following the end of the calendar year. If donating through CanadaHelps, you will receive a tax receipt via email immediately following the transaction. Would you prefer to donate by cheque? Please contact us to make arrangements. Contact us to make arrangements to drop off donated items.